Though it may seem overwhelming at first, raising chicks is one of the most fun and enjoyable parts about working with chickens. And as an added benefit, your chickens will be used to you almost from the moment they are born! Here is a quick guide to raising chicks on your own. 1. Set up your brooder. It is almost always easiest to set your chicks up in your bathtub or your shower, simply because once they’ve moved out you can clean up your home more easily. They will remain in their brooding box, but you will likely want to wipe down shower surfaces before you go back to using them full time. Not to mention, showers and tubs have fixtures that are excellent for hanging a heat lamp from. Make sure it is close enough to keep them chicks warm, but far enough away that the shavings don’t catch fire. Give the box a good layer of shavings so the chicks don’t slip and slide around and set up their feeder and waterer in the box on a level location. Wet shavings have to be changed more frequently. 2. How hot is too hot and how cold too cold? 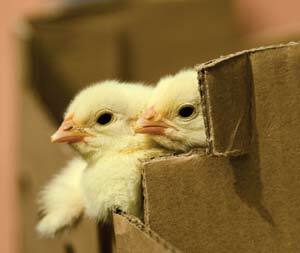 Chicks need to be kept in about 95˚ until their second week. After that you can decrease the temperature by five degrees every week until they’re at your average temperature. By then, unless it is unusually cold, they should be able to survive without the heat lamp. Keep an ear open, however, as loud peeping often signals distress and could mean they are too cold. It is important that you keep an eye on how they handle your bedding. If it is too slippery, or they are trying to eat it you’ll need to replace it. Also, REMEMBER to NEVER use cedar shavings as they are toxic. Pine is okay, cedar is not. Feeding and watering your chicks is critically important. Water must be available at all times and chick starter should be fed for the first six weeks. Then you can switch to a pullet or grower feeder till 20 weeks at which point they can be switched to lay feed. Remember, it is important that you do NOT feed medicated starter to mixed fowl as it will kill ducklings. Broilers and fryers are different- they need a higher protein starter and you will need to purchase one that is specifically for them. You will also need to provide your chicks with grit. Grit is small stones that birds eat that help to grind up their food in place of teeth. You can get chick grit through your local feed store or parakeet grit at a pet store. Do not, however, give them oyster. Oyster shell is not grit, it is additional calcium that laying hens may need in shell production. It will cause bone development problems in young birds. Set your chicks out with everyone else when they are between 6-10 weeks old. You will need to have a coop for them outside if they are your first and only birds, and you will want to keep an eye on them and make sure they aren’t too bullied if they aren’t. Keep them separated during the day for the first few days and then return them to the brooder at night so that everyone gets acclimated to everyone else. Two common problems chicks can experience in their brooder and even straight from hatching are curled toes and spraddle legs. These are relatively easy to fix. Curled Toes: Place a small length of pipe cleaner beneath each toe to straighten it and tape it around the toe. Alternatively, flatten the toes on something like a band-aid pad or stiff-ish piece of gauze and tape them down. Curled toes must be handled in the first two or three days while the bones are soft. Spraddle Leg: Spraddle leg is caused by the poor floor that your chicks keep sliding on. The first step is to get a better flooring for them. Then you need only gently pull the legs back into place and secure them with a bit of pipe cleaner. While the bones reset they will still be able to hobble around, but their legs will be straightening back up.